The MSV Palau Siren liveaboard is 40 meters (130 ft) in length. This Palau Liveaboard offers very comfortable fully furnished cabins with en-suite bathrooms and an in-cabin entertainment system. She takes a maximum of 16 guests. She carries safety equipment for safe passage at sea including first aid kits, Oxygen, a DAN oxygen kit, two 15-person SOLAS life rafts, and SOLAS life jackets. Her communication gear includes VHF radios, SSB radios for long distance communication, a GPS, radar, echo sounder, satellite and mobile telephones. She has a water maker on board. Nitrox is free. Gear is free. Beer is free. Palau Siren liveaboard’s spacious and beautifully appointed interior saloon has sofa seating and a huge flatscreen TV. The Palau Siren liveaboard has designated indoor and outdoor camera workstations for charging, preparation and maintenance of your camera and video equipment. Large storage drawers for your peripheral items are available, as well as numerous charging points. Adapters are available and the power supply is both 220v and 110v. She also has large rinse tanks with fresh water solely for camera equipment. This beautiful liveaboard vessel truly sets the industry standard for underwater photography and videography. Meals are eaten at the stern with access to the drink bar for hot and cold drinks throughout the day and night. She features a 24 hour push button espresso maker and a hostess and bartender to make cocktails and to serve you delicious after-dive hot and cold drinks. The diving area is huge and well organized with each diver having a personal station with drawers for accessory storage. The crew handles all tanks and diving is done from two fast fiberglass skiffs which cruise at 27 knots. She is one of the best Palau Liveaboards operating today. 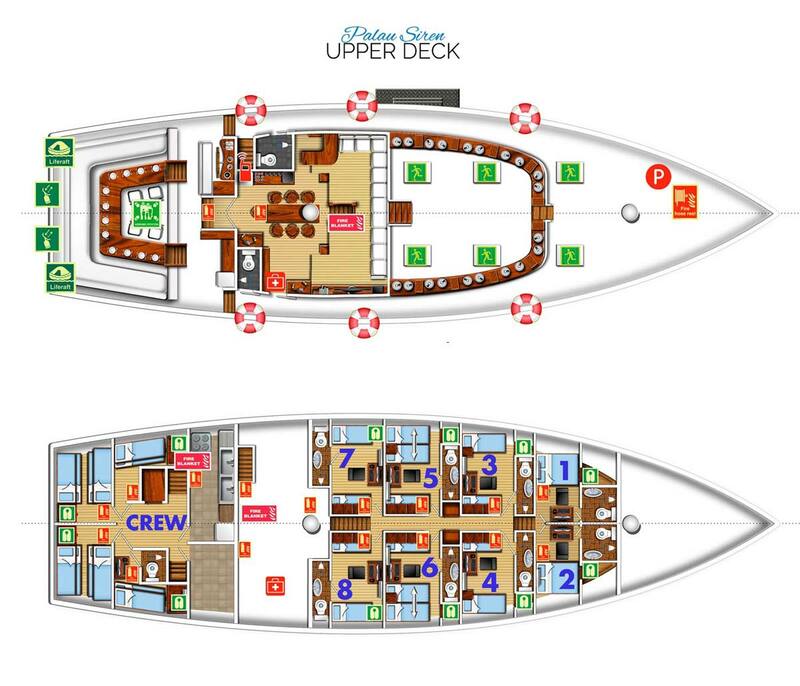 The MSV Palau Siren Liveaboard has eight very large, very comfortable cabins with either double beds or twin beds. The two mid-ships cabins can be converted to either double or twin beds for flexibility. She has a total of 10 bathrooms on board complete with hot and cold showers. All cabins are en suite and there are two bathrooms on the ship’s main deck for use without going down to your cabins. The cabins have ample storage for your belongings, as well as a lockable safe and personal reading lights. Palau Siren is a Palau Liveaboard and operates in Palau throughout the year. She is available for individual bookings as well as charter cruises. Individual prices are listed below in the schedules. Please contact us for charter prices. All Palau departures are from Koror, Palau, serviced by the Roman Tmetuchi International Airport (ROR). Transfers are provided from your hotel or the airport to the vessel, a 30 minute drive. Please note: Approximately 22 dives. The Palau Siren offers six, seven and 10-night itineraries throughout the year. Above is a sample seven-night tour. For detailed itineraries, check the trip you’re interested in on the schedule below and we’ll email you the full itinerary. Itineraries are for general information only. We make no claims to being 100% accurate as there are too many factors affecting the schedule. We will give you the best diving on the best spots we can each day.